Barcelona fought back from a one-goal 1st Leg deficit to secure a spot in the semi-final with a 2-0 win against their city rivals. Barcelona completed the job in the first half with goals from Luis Suarez and Lionel Messi, but could’ve added more to allow fans around the world to breathe easier. However, Barcelona were in complete control from start to finish even though the finishing could’ve/should’ve been better. From the opening whistle Barcelona dominated possession as from the get-go Espanyol defended deep with all eleven players. That made penetrating through the middle difficult and with both wingers often dropping deep to at times form a six-man back-line there wasn’t plenty of space there either. Regardless, Barcelona opened the scoring after just eight minutes, after a turnover in transition by the visitors. Lionel Messi played Aleix Vidal down the right wing and he sent a perfect cross into the middle to Suarez who promptly headed the ball into the back of net, tying the tie on aggregate. Espanyol looked to catch Barcelona napping, quickly attacking after the restart, but after a very rare poor clearance from Samuel Umtiti, Japer Cillessen was in perfect position to make the tricky save on Gerard Moreno’s shot. Barcelona were quick to return to attack, but Espanyol’s defense kept Pau Lopez’s area mostly traffic-free. Barcelona created the most danger from Messi’s long free kicks and crosses from the right side, but Lopez only had to punch out a single cross. 25 minutes in, Barcelona were leading by two. Mario Hermoso was able to stop Messi on the initial attack, but he and David Lopez made a mess of taking the ball out of Espanyol’s third and Messi, with some help from Vidal, stole the ball back. After making his way to his left, Messi fired on goal. Lopez seemed in a good spot to make the save, but the shot ricochet off a defender, sending the ball into the opposite corner and Barcelona into the lead. Just a couple minutes later Barcelona could’ve added another. Sergi Roberto and Suarez combined beautifully on the edge of the area, with the latter sending the former deeper into the area on the right side. Roberto looked to return the favor immediately, finding Suarez in a great spot and with no defender in sight, but looking for the first-time finish the Uruguayan missed the ball completely. In the 33rd minute, Messi, Suarez and Vidal combined again, with Vidal setting up Suarez for a shot with a nice cutback pass, but his powerful drive was blocked. Barcelona were in firm control of the game, at times seeing as much a 81% of the ball, but just a single goal from Espanyol could’ve turned everything around. With referee Mateu Lahoz handing out yellow cards to Barcelona players like candy, another Barcelona goal was a must for a calmer continuation of the game. Messi could’ve done just that just moments before the halftime break, but he couldn’t cash in on the difficult opportunity after a fantastic pass from Sergio Busquets. Even had he scored, the linesman raised the flag even though replays showed Messi was level with the last defender. After a failed Espanyol counter attack Lahoz whistled for halftime. Needing a goal, Espanyol brought on a second attacker before the restart, with Leo Baptistao replacing Sergi Darder. But, like in the first half, Barcelona would attack from the whistle, creating their first chance in the 50th minute after a long Messi cross from a free kick, but Busquets reacted poorly after the ball somehow made its way to the far post. Baptistao would attack shortly thereafter, but Cillessen made the save on the tough-angle shot. 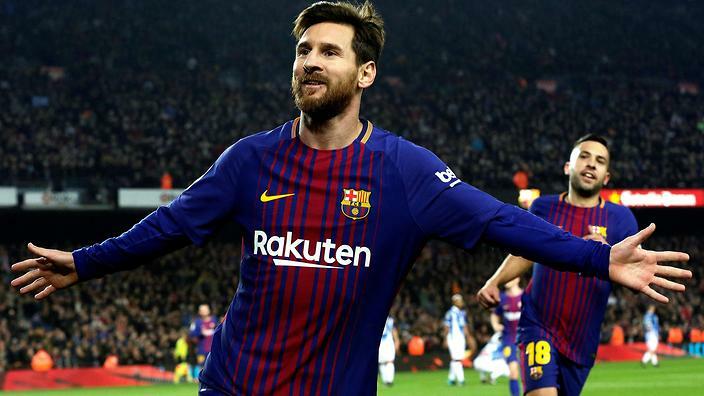 In the 55th minute, after Espanyol’s first corner kick of the match, Barcelona launched a counter, ending with Messi unleashing one from 25-yards out, but Lopez made the diving save. Barcelona continued to put pressure on Espanyol’s defense, but the visitors were able to hold Barcelona to the outside. After 62 minutes, Vidal was the first substitution Ernesto Valverde made - he was replaced by Paulinho, while Philippe Coutinho continued to warm up. Quique Sánchez Flores brought on yet another forward in the 65th minute, Sergio Garcia replaced Esteban Granero. Three minutes later, Coutinho made his Barcelona debut, replacing Andres Iniesta. The Brazilian looked to quickly join in on the action, combining nicely with his teammates with little space on the left wing. After a about a minute, he was also welcomed by Espanyol with a hockey-style body check. A more worrying scene occurred in the 72nd minute when Garcia stomped on Suarez’s ankle, but after some help from the medical staff he was able to continue. Barcelona should’ve put the game out of reach in the 75th, but not once, but two times they couldn’t finish a one-on-one. Messi opened up Espanyol’s defense before finding Coutinho cutting in from the left wing. Coutinho wasted no time and found Suarez in a great spot to finish off the play, but he connected poorly with the ball and Lopez made the save. The rebound, however, fell right to Ivan Rakitić on the opposite side. The Croatian put a much better shot on goal, but Lopez was quick to recover and made a fantastic save. Even though Barcelona controlled the game, the lack of a third goal made for a tense last 15 minutes. Just one mistake was needed for Espanyol to advance. With just under five minutes left, Espanyol made their final sub, bringing on the scorer from the first leg, Óscar Melendo. Espanyol were leaving more space at the back as they attacked for tie-deciding goal, and Barcelona almost took advantage of that in the 89th minute. The cross came from the right side and in the middle Messi outmuscled his way into a good position before powering the header on goal but way denied by the post. Three minutes were added on as Espanyol were readying for a final push, but Barcelona stepped up the ball, rarely allowing more that the occasional touch to an Espanyol player. Valverde made a tactical change in the dying seconds with Andre Gomes replacing Rakitić. Barcelona were expertly killing time near the corner flag and Lahoz had to end Espanyol’s dreams of advancement with the final whistle. Barcelona therefore join Sevilla, Valencia and Leganes in the semi-final of the Copa del Rey. Up next though is a home match against another Copa quarter-finalist, Alaves, who came close to upsetting Valencia.